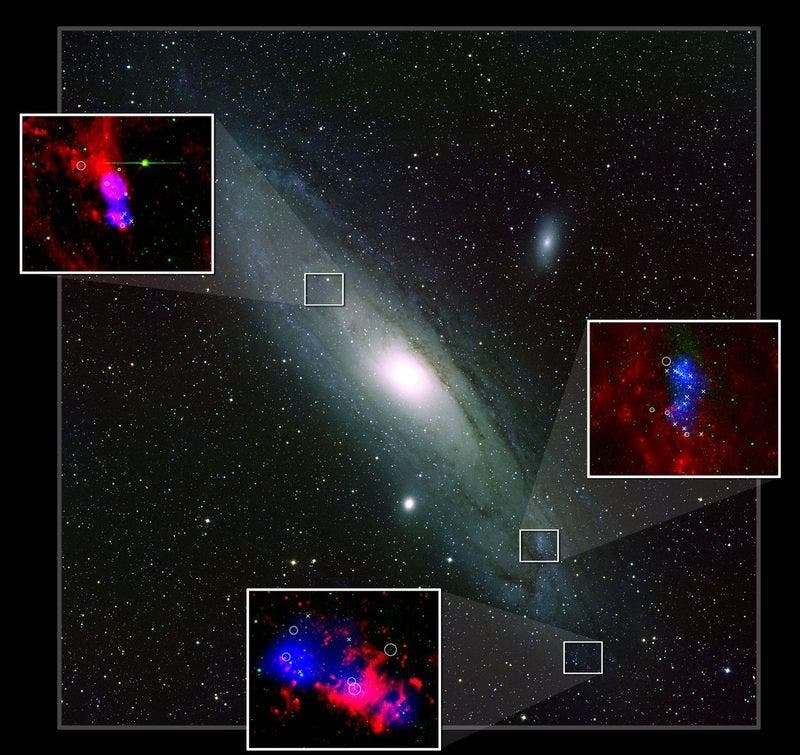 A team of NASA and European scientists recorded the "fingerprints" of mystery molecules in two distant galaxies, Andromeda and the Triangulum. Astronomers can count on one hand the number of galaxies examined so far for such fingerprints, which are thought to belong to large organic molecules (molecules that have at least 20 atoms or more), says the team's leader, Martin Cordiner of NASA's Goddard Center for Astrobiology. This is quite small compared to, say, a protein, but huge compared to a molecule of carbon monoxide, a very common molecule in space. The findings provide some evidence against one of the top candidates on the list of suspects: polycyclic aromatic hydrocarbons (PAHs), a group of molecules that is widespread in space. The research also reveals that some of the signatures found in Andromeda and the Triangulum are similar to ones seen in our own Milky Way, despite some big differences between those galaxies and ours. Until now, only two galaxies beyond our own have been investigated in detail for DIBs. Those are our nearest neighbors, the Large and Small Magellanic Clouds, which lie 160,000 to 200,000 light years away. Andromeda and the Triangulum are located much farther away, at about 2.5 to 3 million light years from Earth. "At those distances, individual stars are so faint that we need to push even the largest telescopes in the world to their limits in order to observe them," Cordiner says. "The first step is choosing which stars to observe," Cordiner explains. Cordiner's colleagues at Queen's University in Belfast, U.K., took the lead on finding good targets. They picked blue supergiants—stars that are very large, very hot and very bright. Supergiants also burn very clean: unlike our sun and other cooler stars, they contribute little background clutter to the observations being made. In the image above, The Triangulum Galaxy, located nearly 3 million light years from Earth, is another far galaxy where researchers have found diffuse interstellar bands (DIBs). The detailed observations needed to see DIBs along a straight line from Earth to an individual star in such a distant galaxy stretch the limits of even the largest telescopes. Recently, more interest has been focused on at least one small molecule, a chain made from three carbon atoms and two hydrogen atoms (C3H2). This was tentatively identified with a pattern of DIBs. On the list of DIB-related suspects, all molecules have one thing in common: they are organic, which means they are built largely from carbon. Carbon is great for building large numbers of molecules because it is available almost everywhere. In space, only hydrogen, helium and oxygen are more plentiful. Here on Earth, we find carbon in the planet's crust, the oceans, the atmosphere and all forms of life. Astronomers "see DIBs pretty much in any direction we look," says Jan Cami, an astronomer at the University of Western Ontario, Canada. He has collaborated with Cordiner before but was not involved in this study. "And we see lots of DIBs." are essentially the one-dimensional carbon molecules, PAHs are the two-dimensional ones, and fullerene compounds are the three-dimensional ones." "But being on Earth and looking at another object in the Milky Way is like being in the crowd at Times Square in New York City on New Year's Eve and trying to find your friend," explains Nuth. "It's much easier to spot the person if you are on a balcony rather than standing in the crowd yourself." Likewise, it's much easier to get a clear overview of a galaxy when you are outside of it. "If we're going to understand fully how interstellar chemistry works—how stars and planets form," says Cordiner, "then we need a full understanding of the ingredients they use." Andromeda image at top of page: Andromeda is one of two distant galaxies where astronomers recently searched for diffuse interstellar bands (DIBs). If DIBs were found when looking in a straight line from Earth to a star in the galaxy, the star is circled. Bigger circles indicate stronger DIBs. An "x" means no DIBS were observed. The colors in the insets correspond to wavelengths of the spectrum: blue for UV, green for visible light, and red for infrared. Credit: M31 image by Bill Schoening, Vanessa Harvey/REU program/NOAO/AURA/NSF. Insets from Nick Cox, Institute for Astronomy, K.U. Leuven.